Develop a suite of leadership programming that will support their continued success in all areas. Our ongoing work is conducted in partnership with the Office of Institutional Diversity and Inclusion, the Faculty Senate, the Organization of Women Faculty, Feinberg Medical Women Faculty Organization, and the Women's Center. Launched in fall 2016, the Provost’s Advisory Council on Women Faculty supports our women and women-identified faculty through work on faculty development and leadership, work-life issues and policies, and pipeline advancement, in order to foster gender equity and even greater career success. Comprised of approximately fifty women and men faculty from across the schools, the Council is part of our collective larger focus on improving diversity and inclusion at Northwestern. Read more about the Council and its ongoing work HERE. We are pleased to share Women Faculty at Northwestern: An Overview, a report compiled by the office of the Associate Provost for Faculty examining gender equity at Northwestern. The data report provides a snapshot of numbers and percentages of tenure-line and clinical/instructional faculty by gender, rank, race/ethnicity, and the doctoral pipeline, as well as documents the gender breakdown of leadership positions and named chairs. Historical trends show a steady, but slow, increase in the number and percentage of women faculty and pose a challenge to the University to accelerate growth in gender equity. Many of these data are available in various other formats, including the 2016 Report on Faculty, Staff, and Student Diversity and Inclusion at Northwestern, and the Northwestern Data Book on the Administration and Planning website. We hope that bringing them together in this format is valuable to the Northwestern community. Navigating Tenure - by invitation only, all pre-tenure women faculty on the Evanston campus are invited to attend a confidential discussion led by a group of tenured women faculty. School and Office administrators do not attend this program. Discussion topics may include: department, school, or central resources that are available to help junior faculty members balance their research, teaching, service, and personal lives; advice on identifying and cultivating mentoring relationships; general and school-specific expectations and timetables for tenure; and strategies for developing a tenure dossier. Communicating Science - This program is by invitation only to women faculty in the STEM fields, including the quantitative social sciences. Participants are led through a series of improvisational exercises and communication activities to help them develop a set of tools to become more effective communicators about their research and its impact. 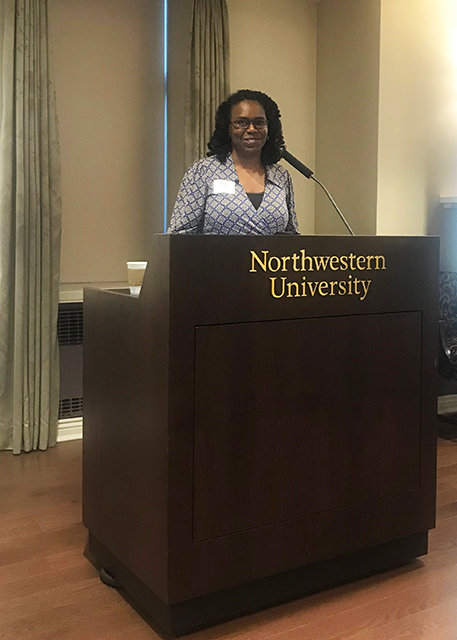 Women Faculty Receptions – held twice annually and alternating between the Evanston and Chicago campuses, these events bring all women faculty together to connect, network, and learn about the work of a prominent female faculty member. Past receptions have featured Kim Yuracko, Wendy Pearlman, and Crystal Clark. In fall of 2018, Miriam Petty, Associate Professor of Radio, Television, and Film, School of Communication, shared remarks about her research, teaching, and writing surrounding the history of African American representation in Hollywood film. On May 11, 2017, Smith College President Kathleen McCartney delivered a talk entitled “Walls, Words and Ways Forward — Creating Opportunity for Women Leaders.” Learn more about her visit and inspiring remarks. On April 19, 2018, Beverly Daniel Tatum, Spelman President-Emerita and author of Why Are All the Black Kids Sitting Together in the Cafeteria?, spoke to the Northwestern community. This novel partnership between Northwestern University and the University of Chicago provided joint programs and research to support the careers of our women faculty in the STEM fields. Although this formal partnership has now concluded, our efforts continue to build upon and amplify the leadership development and community-building opportunities that were hallmarks of this impactful program. Learn more. Questions? Contact Joan Johnson, Director, Faculty, joanmjohnson@northwestern.edu.